The beautiful canals of Venice. The city that is slowly sinking back into the lagoon is possibly one of the world’s most famous. Many travelers who find themselves snacking and drinking their way across Tuscany will inevitable pop in for a visit, because who can resist – especially if you’ve never been? I’ll be honest: Venice was not one of my favourite destinations in Italy. It’s a small town and it almost needs some capacity limits – the crush of travellers while we were there was almost just too much to handle. Off season times are better – summer and Carnevale time (the two weeks before Ash Wednesday) are the worst. But that slightly downer aside, it is still a wonderful place to visit. 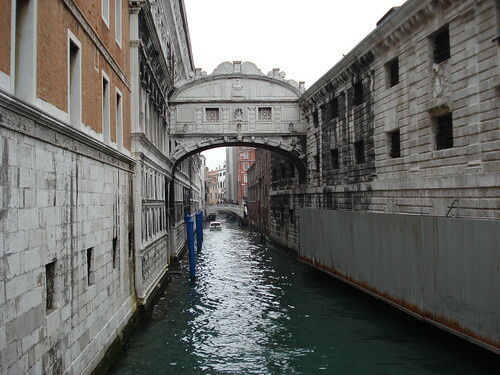 Without a doubt, the canals are the big draw to Venice. It’s not that the canals were built, its that they are the waterways that run between the over 100 islands that make up the city. This was once a muddy delta, just a few tiny villages spread out across the shore. Once the settlers realised how useful these canals might be if boats could pass through them, the canals were dredged, and because of its uniqueness and its perseverance to be a centre for wealth, the city prospered. 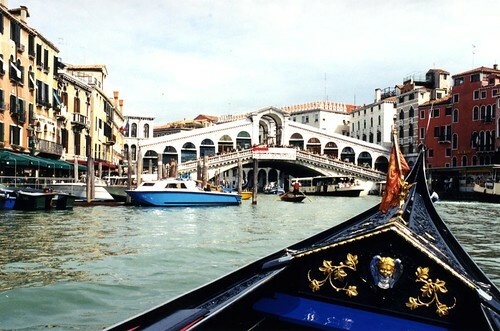 While you’re here you will want to partake in a gondola ride, especially if the weather is nice. It’s terribly touristy, and I’m afraid we found the gondoliers to be awfully rude and unfriendly. On top of that, it is kind of expensive. But we went for it, and definitely enjoyed it. Similar to other water-based cities like Amsterdam, the view from a boat or craft is very very different. On a sunny day, you just can’t miss it. Doge’s Palace: This was one of my favourite guided tours – I think we took the “Secret” itinerary – which explains the workings of this administrative building and takes you into some of the interesting spots of the structure. Rialto Bridge: This is one of the most famous bridges in the world; it’s actually a street of shops that goes across the bridge. I guess when space is at a premium, you put the shops wherever you can fit them. These are all on the “main” area of Venice, but I also encourage you to take advantage of the boat service to explore some of the islands you can’t walk to, such as Burano, which has row after row of pretty houses. There’s also an island with a glass blowing museum, Murano. And don’t forget, this is Italy, so you’ll have plenty of tasty food and drink at your disposal; check out a guidebook for recent reviews and recommendations, or just wander down the canals until you spot an open table at somewhere that looks good. Venice has a railway terminus connecting the mainland, and if you’re visiting here from anywhere else in Italy, this is probably the best choice as its easy and service is frequent. The airport on the mainland, Marco Polo airport, also has low cost carrier service, including Ryanair, so this might be better if you’re travelling here from the UK or other European countries.